Your response can be as short as “I support the balance of probabilities as the standard of proof. Many thanks, [YOUR NAME]” Below is the response from the Women’s Officer which covers different areas, such as the background of the consultation, before highlighting what is good about the revised procedure. I would first like to thank you for the hard work that has clearly gone into the revised policy and procedure for student disciplinary cases. It is appreciated by myself as the current Women’s Officer, and the entire Women’s Campaign and its supporters, who have been working to reform the disciplinary procedure and central university policies on sexual harassment since the ‘Cambridge Speaks Out’ report in 2014, and the 2015 ‘Mind the Gap’ report. 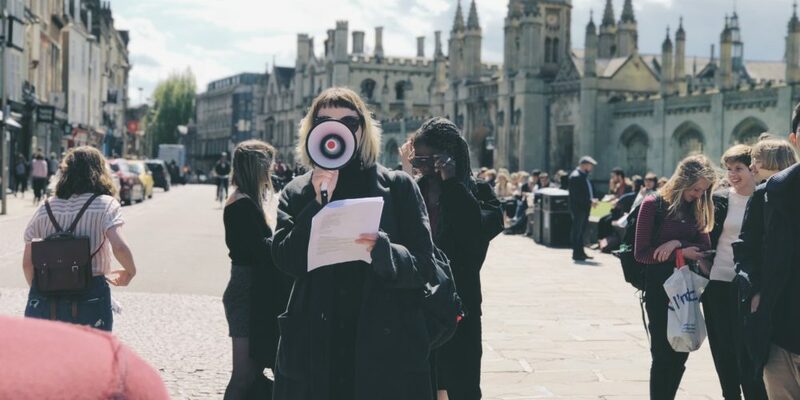 It is especially appreciated following the work of the 2017-8 Women’s Officer, Lola Olufemi, and the Women’s Campaign for that academic year, who called the Senate House discussion to outline the need for reforms to the Disciplinary Procedure. It is encouraging to see that by working within the university’s governance and together with OSCCA, we have a revised policy and procedure that will make the process of using the disciplinary procedure a possibility for students who report sexual harassment and assault. I trust that the final stages of the review process will appreciate the amount of student support for changing the procedure. I am aware that there are a small number of students who willfully misconstrue the arguments that we present when calling for changes that make the procedure and policy clearer, more comprehensible and comparable with the best practice outlined by the Office of the Independent Adjudicator. I see no benefit in having a student disciplinary policy or procedure that is inaccessible and often harmful to those it is designed to support, due to the attachment that some members of the university may have to tradition and the concept of Cambridge as an institution which does not need to satisfy best practice. In my experience as Women’s Officer, and a member of the Women’s Campaign during my time as an undergraduate here, I know that the disciplinary procedure as it currently stands continues to let down those who want to find meaningful institutional justice against members of the universities who have violated their dignity through forms of harassment and assault. We are at a very important step in the University’s mission to “improve the prevention, response, support and investigation of all instances of harassment and sexual misconduct; and to enable staff and students to make disclosures without fear of reprisal,” as outlined in their 2017 statement during the launch of the Breaking the Silence initiative. Currently, students who would like to use the disciplinary procedure in cases of sexual harassment and assault are put off by the length of the procedure, the legal framing of the procedure, and the need to relive what can often be an incredibly traumatic experience. By changing the student policy and procedure to the revisions which are in line with best practice, and those that respond to the needs of the student body expressed by our years of campaigning, there is a real chance to repair trust in the university’s disciplinary procedure and its public commitment to creating an educational environment for all. The changes that I am most relieved to see in the revised policy and procedure are introduction of a full-time Investigator role; the acknowledgement that the procedure is an internal process, not a court of law, and the relevant changes to the language of the policy and procedure; the inclusion of intimate partner violence under what constitutes abusive behaviour; and the requirement of appropriate training for all decision-makers and investigators involved with the process. I am very happy to see the revision that the standard of proof has been changed from the criminal burden of proof to the civic standard of the balance of probabilities. I think this is a change that will restore the student body’s faith in the potential of the procedure to find meaningful justice. To keep the procedure as transparent, consistent and easily understood, I agree that a single standard of proof for all cases must be adopted. Given that the balance of probabilities is the only standard that can be used due to the requirements for students who are subject to fitness to practice, it is clear that we must be using the balance of probabilities as our single standard of proof. To require a different standard of proof for students dependent on their course of study would create a procedure that was hardly different from the previous inaccessible and less rigorous procedure, due to those inbuilt irregularities. A single standard of proof, the balance of probabilities, is what I would reinforce as one of the most important changes to the procedure. I appreciate the policy changes to highlight that a written apology could be a potential outcome, only if wanted by the person who has made the complaint. Some students find receiving letters from those who have harassed or abused them an unwelcome and often difficult experience. The reforms to the appeal process to make it both possible and within a 30 day time limit is also important. I find the revised procedure and policy documents a promising step towards changing the culture of harassment, assault and disclosure within the university. Embedding accountability into the procedure at all stages is important, so I would like as much clarity as there can be on the systems that are in place for the students using the procedure, such as those who might encounter some particular or interpersonal issue with the Invigilator or need extra support due to accessibility requirements. The important thing to follow this final consultation and review is to publicise and communicate the new procedure, and the relatively new role of the Sexual Assault and Harassment Advisor. I am aware in my role on the Students’ Union that students are unaware of the central university’s formal and informal disciplinary procedures, which often leads them to using college disciplinary procedures that are unregulated by impartial bodies like OSCCA. Publicity of the new procedure must not fall solely on the Students’ Unions, but be treated as a priority for all, particularly the parts of the University administration that have the budget and resources to publicise the procedure and the in-house support services across the colleges, departments and faculty spaces. Thank you for taking the time to read my response. Working with OSCCA during my time as Women’s Officer has been incredibly useful and an enjoyable experience. It makes me appreciate how hard Women’s Officers have worked before me when there was no office within the university dedicated to dealing with student complaints and behaviour. This revised disciplinary procedure and policy may only be one part of the work we continue to do on changing cultures of harassment and reporting in the university, but it is an important part.